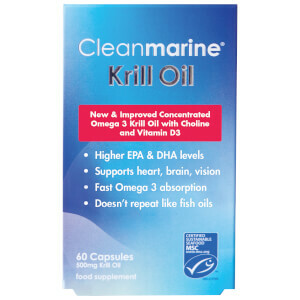 Cleanmarine Krill Oil gel capsules are an easy-to-consume food supplement to provide you with essential Omega 3 acids, which contribute to healthy heart, brain, eye and joint function as well as helping to enhance your mood and improve concentration. Why choose Krill Oil over Fish Oil? Krill are shrimp-like crustaceans that provide a more sustainable and ethical source of Omega 3 with zero by-catch. The acids within Krill Oil are bound to phospholipids, a major component of human cell membranes, thus are much more rapidly absorbed than the fatty acids from fish oil supplements. Krill Oil is also rich in Astaxanthin, a natural antioxidant, and there’s no fishy aftertaste. When taken on a regular basis, the Krill Oil supplements help maintain a healthy blood pressure and support normal brain function. Phospholipids (Omega 3 rich) 200mg, Omega 3 110mg of which: EPA 60mg, DHA 27.5mg, Omega 6 10mg, Omega 9 40mg, Vitamin A 20µg, Vitamin E 10µg, Astaxanthin 40 µg.